In a society soaked in individuality, it's hard for even people of faith to know how to care for others. Leave it to Warren Wiersbe, one of the most respected and articulate Bible teachers of our time, to give Christians a firm yet loving reminder of our biblical mandate to care.In this second book of the Living Lessons from God's Word series, Wiersbe outlines what the Bible says about meeting each other\u2019s needs in the power of Christ's love. "We are not alone in our Christian walk, and we must have others in our minds and hearts as we pray, study the Word, and serve our Lord," he writes. With the clarity his readers expect, Wiersbe highlights text after text in his quest to underscore the importance of becoming Caring People. Because Christians belong to each other and bear the fingerprints of a loving God, we are required to bear one another's burdens, to share hospitality, to boost and build each other up, and to show preferential treatment to all, especially "the least of these." 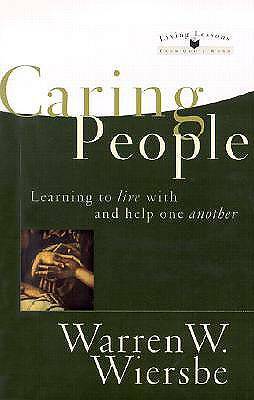 Caring People was previously published in 1981 as How to Be a Caring Christian. Readers who want to learn how to care more easily and more effectively will find Wiersbe\u2019s guidance opens the door to new blessings and abundance.